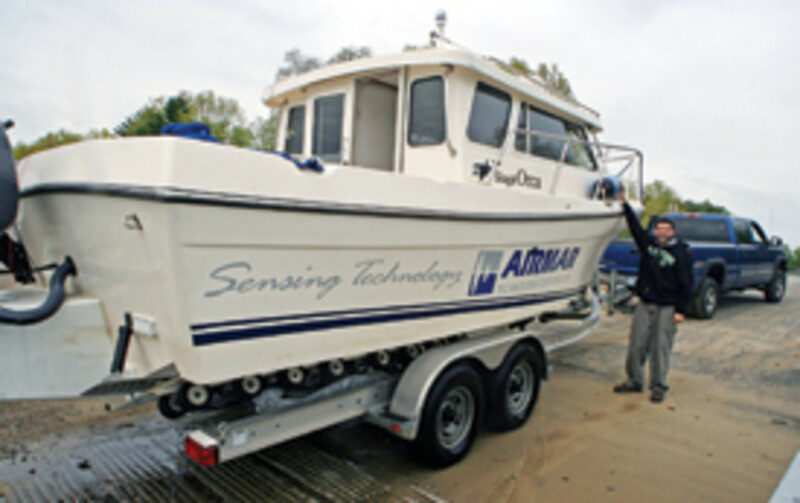 Airmar product manager Mark Reedenaur is showing off the company&apos;s floating test lab. "Come on, Mark, can&apos;t you just tell me which is the best fishfinder?!?" I couldn&apos;t help making that plea when I realized what a fantastic floating fishfinder lab we were headed out to sea in. Before launching the 24-footer into the Piscataqua River, which separates Maine from New Hampshire, Airmar product manager Mark Reedenaur had led a crawling tour of her vast transducer array. It ranged from a familiar 600-watt 50/200-kHz transom-mount P66 to a new 1-kW wide-beam 200-kHz SS264W, whose tilted element enables a low-profile through-hull installation. 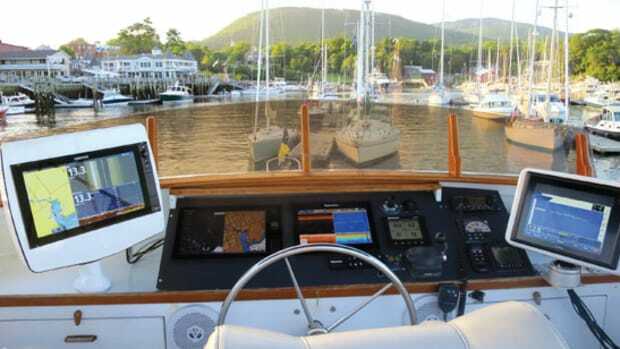 Inside the wheelhouse were multifunction displays (MFDs) from Garmin, Lowrance, Furuno, Raymarine, and Northstar plus a web of plugs and switches that allowed us to try each MFD with a quick succession of transducer inputs. 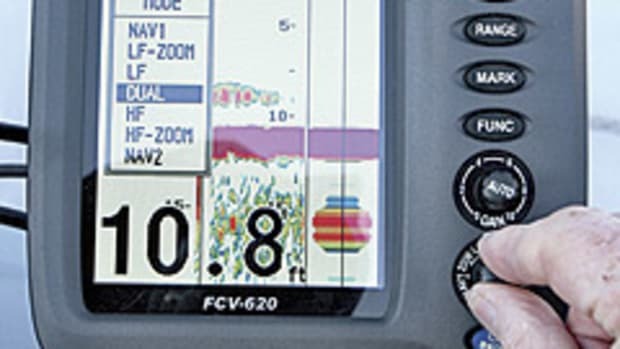 If it is possible to determine the top fishfinder, I thought, this is the tool for the job. But I knew Reedenaur wouldn&apos;t answer my question, even if he has developed a personal opinion. 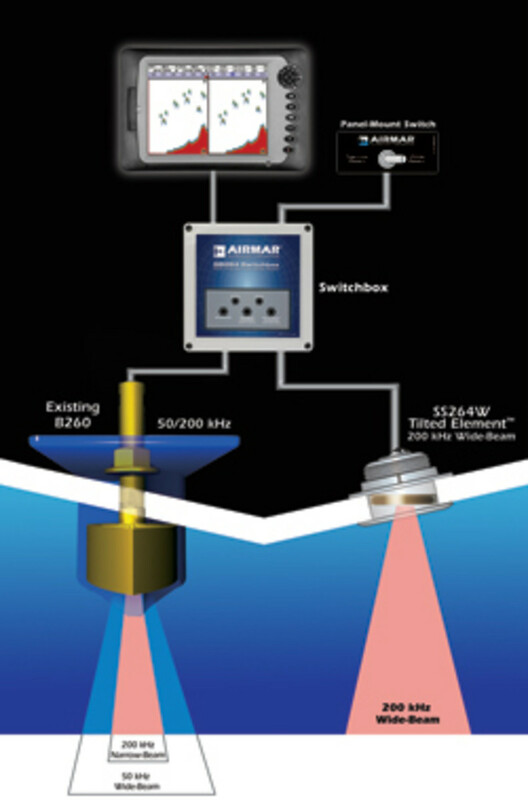 Airmar manufactures the majority of depth- and fishfinder transducers in use and particularly dominates the higher-end models offered by the brands I just named and nearly all the other brands, too. A key to such success is a deep, nonpartisan deference to what Airmar&apos;s business partners bring to the game, i.e., how they process the raw data coming from the transducers and how they help you to manage its display. So the point of this trip was not to compare fishfinders but to see how different transducers affect their performance. Since Airmar competes largely with itself, Reedenaur&apos;s goal was to demonstrate that its better sensors are worth their extra cost. It wasn&apos;t a hard point to make, given the floating lab. While there weren&apos;t many fish off New Hampshire that day, we did find a few, and the area is chock-a-block with interesting structure in the 100- to 200-foot range, not to mention wire lobster traps, which seem as tricky to distinguish as, say, bottom-hugging cod. Using one MFD after another, Reedenaur climbed up the transducer power and quality ladder, from the P66 through several in- and through-hulls, including the classic 1-kW B260, and finally to the 264W. 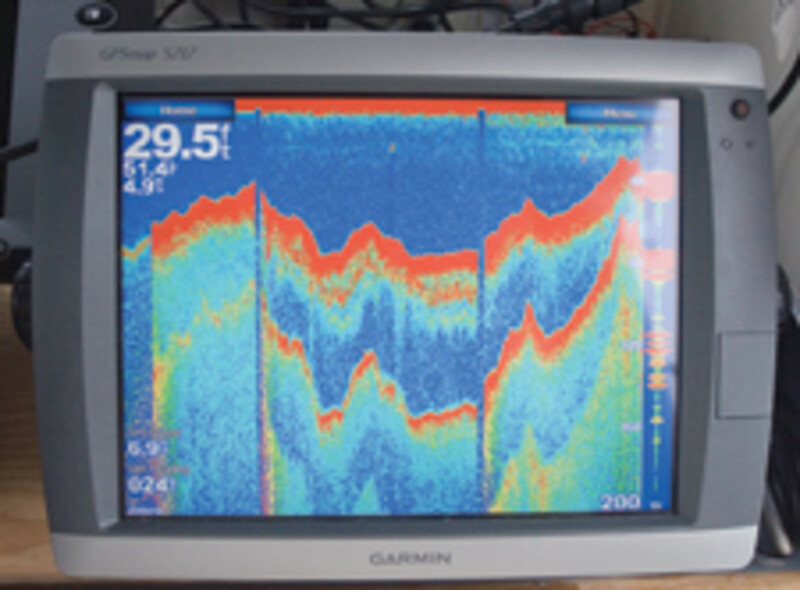 On every fishfinder screen, the strength and detail of the returning pings improved with every step up the ladder. This Garmin has had three tranducers, each one a little better at profiling bottom and fish. Note the words power and quality. Several of the transducers we used had the same 1-kW rating, but their output was noticeably different in relation to what Airmar calls the Q factor. It stands for quality, which could be a vague concept, but not for a company founded and well populated by engineers (see my "Electronics" column "Behind the Screens," September 2005). I could quote you the whole technical definition of how it&apos;s measured, but, trust me, it hurts. What worked for me is the "bell" analogy. A depth transducer is, after all, an acoustic device; a zap of power causes a piezoceramic disk, or multiple disks, to fire an ultrasonic ping down through the water, and then the same disk(s) go silent and listen for the ping&apos;s return. The precise timing of that return—lots of them—is what you see on your fishfinder. A significant transducer problem is that a piezoceramic, like a bell, tends to ring after the initial zap, confusing the whole millisecond ping-listen process. 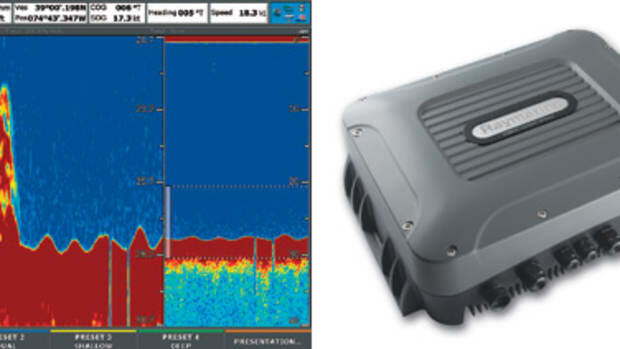 A transducer with a low Q—the value is specified for all Airmar models—hardly rings at all and thus can generate a more precise and detailed fishfinder screen. Of course they are harder to make and thus more expensive. In fact, the transducers we tested range widely in cost—from a little more than $100 to about $1,800, so while I&apos;m now convinced that you get visibly better information with a better sensor, I would not venture to estimate what your particular cost-benefit point might be. There&apos;s lots more to transducer performance than Q and wattage, and Airmar engineers seem to be exploring every option. Take the tilted-element concept mentioned earlier. Such a through-hull can point more or less straight down for maximum performance, but it doesn&apos;t need a fairing that might cause performance-robbing aeration at high speeds (and trouble getting a boat on and off a trailer). However, it&apos;s nearly impossible to fit a combination of high-power, dual-frequency ceramics into a flush-mount casing, which is why Airmar now offers tilted elements in 1-kW pairs. This diagram illustrates wide-beam and tilted-element features. Consider, too, the subtleties of wide beam. Due to the nature of acoustics and ceramics, a low-frequency transducer typically hears deeper and with a wider beam, while a high-frequency one hears more detail in a narrower beam. The beam difference—which in the B260 case illustrated at right means imaging a bottom diameter of either 34 feet or 11 feet in 100 feet of water—can be either useful or confusing. 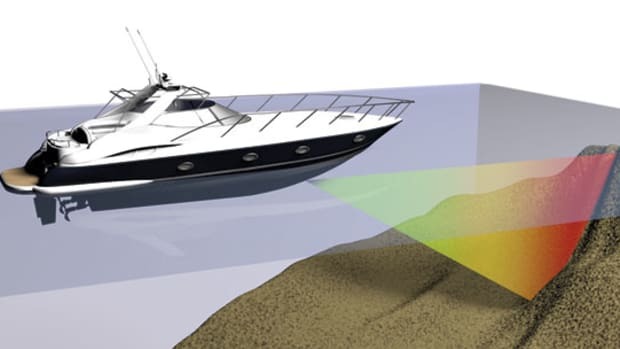 That&apos;s why Airmar has figured out how to build 200-kHz ceramics whose beam width, and hence fishfinder-image swath, matches a 50-kHz ceramic and also why it offers a switch so you can go back to the narrow beam when you want. Airmar has also developed an "XID" chip, which is now built into many of its transducers. 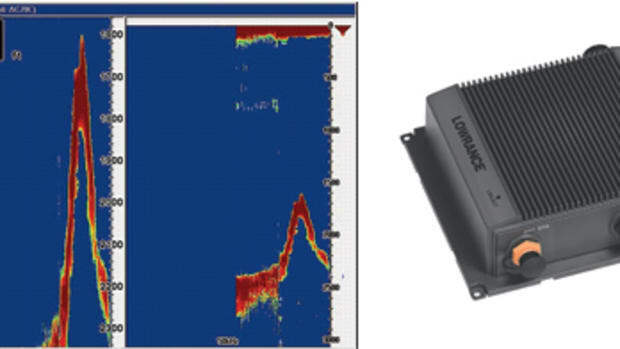 If your fishfinder understands XID, it will automatically know more about an attached transducer than you could normally tell with setup screens. The unrealized goal is to program every XID with a ‘ducer&apos;s exact factory test results, since, like a musical instrument, each ceramic "sounds" a wee bit different. Unfortunately, I did not get to experience either of Airmar&apos;s intriguing high-wattage "broadband" transducers. The $2,995 R209, for instance, can push 3 kW at any frequency from 33 to 60 kHz and 2 kW from 130 to 210 kHz. 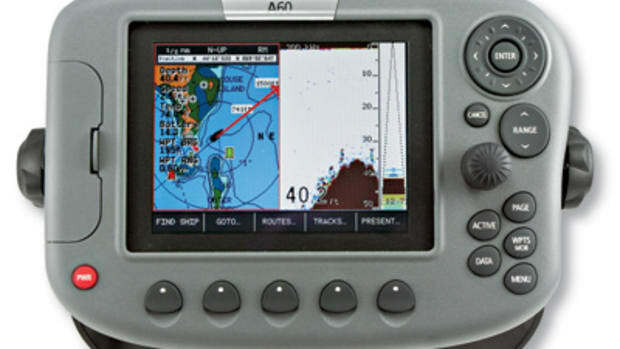 The concept is that you&apos;ll be able to dial in the specific beam width or frequency you want (apparently some fish species show up particularly well using particular acoustic oscillations), but in fact only a few fishfinders, like the Raymarine DSM 400 on page 48, use even a portion of the capability. Even Airmar hasn&apos;t yet enabled the high-resolution "chirp" mode supposedly possible with low-Q broadband ceramics. I sense more fishfinding demos in my future. 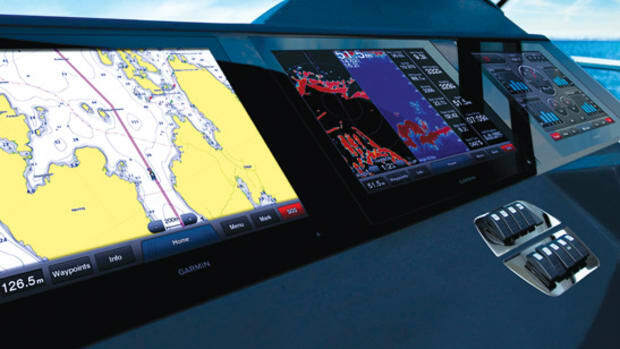 Although I&apos;ve only touched the high points of fishfinder technology in this column, I am happy to report that Airmar has oodles more detail both on its Web site and in print. 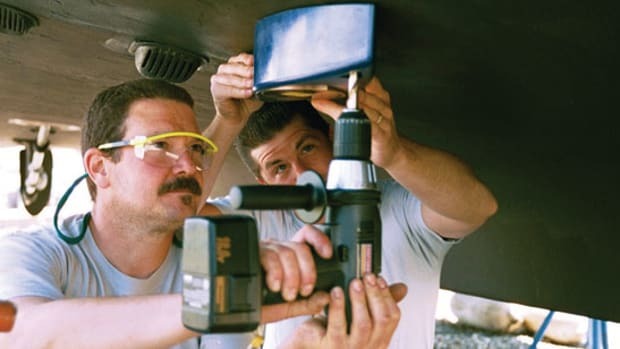 The company also has excellent advice on where to position transducers, which, if done wrong, can cripple performance (and for which boatbuilders should be taking more responsibility). 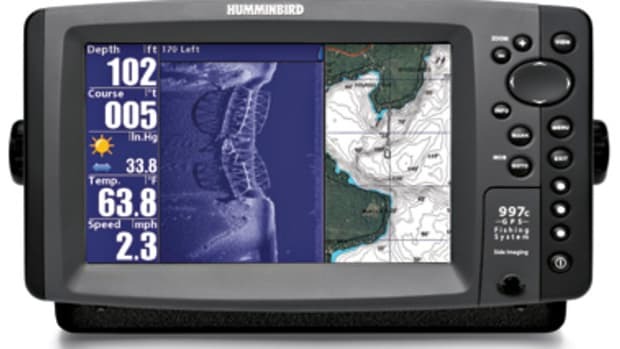 But which fishfinder impressed me the most off New Hampshire? Give me that boat lab for a week—and about ten species of well-trained fish—and I&apos;ll get back to you.